Additional Info: The features of peptic duodenitis are acute duodenitis, Brunners gland prominence, gastric metaplasia, villous blunting, crypt hyperplasia, and sometimes H. pylori infection in areas of gastric metaplasia. The diagnosis of peptic duodenitis is associated with gastritis caused by H pylori.Search for the associated photos in this case. 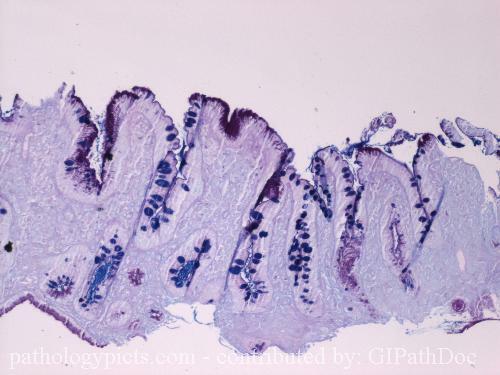 There are 2 different magnifications and this PASAB stain.This is the Periodic Acid Schiff Alcian Blue combination stain, which highlights the intestinal mucin blue and the foveolar mucin deep purple.